As a little girl living in the Philippines, when it it was time to take a nap, I would get into bed with my grandmother and wrap my arms and legs around her until I’d fully sunken into her down comforter softness. I would hold on to her tight because I knew that once I fell asleep she’d find a way to free herself from my limbs and get on with the rest of her day. I didn’t want to let her go. When my grandmother died in 2006 I didn’t make it to her deathbed. I wasn’t able to fly back from the U.S. for her funeral either, so I never got to hold her goodbye. For that first year after, the longing to hug her one more time was this big, constant ache inside of me. I come out of the womb of my mother, who came out of the womb of my grandmother. We’re like a Matryoshka doll—only human, not wooden; Filipina, not Russian. My body comes in part from my grandmother’s DNA, which still very much lives on in my DNA. My grandmother is right here, right now, alive in me. Knowing this doesn’t make the hurt of losing her any less, but it does make the pain feel a little less tender. Now, when I miss my grandmother, rather than looking everywhere and wondering if she’s out there, I sink into my body a little more deeply instead. Because I know that’s where I can always find her. Your post reminded me of after my aunt Jean died, I was on the bus and saw a woman come on who looked exactly like her. I couldn’t take my eyes off her. I wanted to believe that it was her and for a long time i created scenarios over this. Thank you, Carol. Wouldn’t it be great if when see someone who we feel could be a passed on beloved that it’s them channeling their soul through and saying hello? If only. Diahann, this is touching tale. It’s funny how you’d wrap yourself around your grandmother to keep her near to you, as though she wouldn’t be able to separate herself. When my father died in 2005, I began to think likewise, that he lived in me. In fact, I’m accused of being more and more like him, as I grow old—though that doesn’t always come as flattery. I’m sorry that you couldn’t have a final holding goodbye. Peace to you Diahann, and thank you for sharing your experiences. Thank you, Peter! Yes- I regret that I couldn’t be there. One of the life’s “no do-overs” is a person’s last breaths. A definite regret! Peace to you too and thanks for receiving my stories. You’ve given yourself a little Matryoshka love. I love insights like that. It’s a beautiful way to be kind to oneself, and ultimately to carry oneself. Thank you, Tony! It really was a profound aha moment for me. I love what you said, about giving the self a little Matryoshka love. 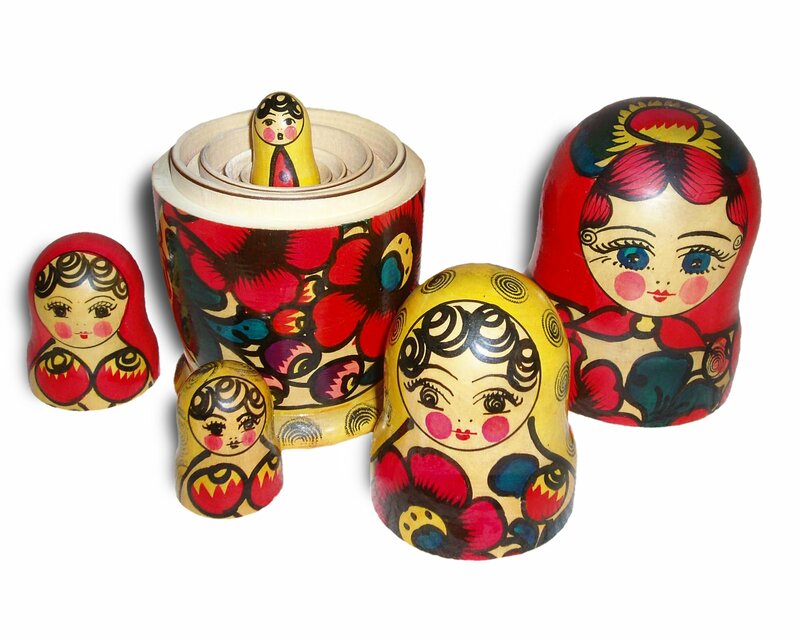 I looked up the word Matryoshka, and it means matron- so mothering the self, I guess- which definitely is an act of self-love. That’s really a comforting realization for me to read about. We have those Russian dolls on our fireplace mantle and it really is a great analogy. I am trying to find the equivalent solace with not having any closure or a goodbye with my Dad (his was a sudden, unexpected departure from this world.) It’s a toughie to reconcile within myself. Thank you for this. So sorry to hear about your father’s unexpected passing, Stephanie. Sometimes I wonder which is worse- the sudden, no warning in advance or knowing and having the time to say goodbye– I think they are about even. Yes, each has its own heartaches, for certain. In my case, there were issues never resolved so I have a lot of regrets. Lovely, emotional, poignant piece. Loved it and it brought up feelings of my own relatives that I was close to and lost. Thank you, Michael! It amazes me how much the dead really do linger with us long after they are gone. I hope those who are on the other side are watching, knowing how much they are missed. Bonjour, Melanie! So glad you loved the post. I didn’t know you also lived in the U.S. Are you in expat? I’m enjoying your posts as well and look forward to reading more. This is very touching. Reminded me of my own grandmother, and how much I miss her. Thank you, Georgia. I feel like the grandparent-grandchild relationship can be so special if we are lucky. It’s no wonder we miss them so when they are no longer around. I’m super jealous of my boyfriend. He’s 47 and both his grandmothers are still here. Oh, how I have missed you. You wrote, as always, about something I can only describe as a visceral hug. Does that even begin to make sense? I hope so. What a smart and simple realization of how to illustrate the generations. I will never look at those dolls, of which I have two sets, the same again. Interestingly, you wrote of your grandmother at a time that mine have been on my mind a lot. I envision them all around me, advising and cajoling me to work on the very things I am at the moment. Are we in the season of grandmothers? Anyway, so nice to see you. Hope you are well, and so, how was the TV/media free month? Robyn! I’ve missed you and your posts too. I was even going to email and see if all was well but then figured you probably have been having a busy summer and I didn’t want to be intrusive. I love that you felt a visceral hug- love that. I also love that you are feeling your grandmothers around you. It is getting to be fall when the veils between the worlds are supposed to be thinner…. your words remind me of this song. And you are looking at me. I pr~ay to you, pr~ay to you. mY TV media free month went pretty well, although I quit a week early after my friend, who was doing it with me said she was out. The impetus got a bit less at that point! Thank you, Drake! I am not familiar with the Chinese box. I will have to look that one up. Thank you so much, Chitali! What a breathtakingly lovely and poignant piece, Diahann! Two things struck me most as I read your powerful words, one more “technical” and one substantive. I so appreciate how you are able to paint such a resonant portrait of your beautiful grandmother and your loving relationship with her: your writing deepens our vivid, sensuous experience of her and your connection. This is a beautiful post, Diahann. Very moving. I couldn’t help but grin at your grandmother’s wonderful humor, the way she laughed when she accidentally used a blue pencil for her eyebrows. Both of my grandmothers passed away about twenty years ago, but I can still hear my grandmother’s jolly voice and remember the way her whole body shook when she got really tickled by something and began to laugh. I’m sure you know this, but your mention of DNA made me think of mitochondrial DNA, which is only passed down–unchanged–through the maternal line. So you do carry a very special part of your mother, and her mother, and all the mothers before them. Thank you, Miranda! I knew about DNA but didn’t know that about mitochondrial DNA even though I guess that must have known it without knowing that I did, since I wrote it, if you know what I mean. Another wonderful thing about the female body! I love that your grandmother laughed really hard too- i wonder if it’s a grandmother thing- having lived long enough to find the funny in life, maybe? I’m happy that you still ‘feel’ her inside you. Such precious knowledge! Thank you, Timi! That is one of my favorite memories of her laughing that way- and the rest of us joining along not because we necessarily knew why she was laughing but because her laughter was so infectious! I love the nesting doll metaphor. What a beautiful tribute to your grandmother. My grandfather died 15 years ago, but I still tear up whenever I think of him…his patience, his kindness and overflowing love. It’s as if his presence lives on. Thank you! I definitely think that the grandparent-grandchild relationship can be so special. Perhaps it’s that grandparents don’t usually have the job of bringing their grandkids up, which allows for all the patience and fun. Sounds like you had that special bond with your grandfather. What a beautiful image. And your story here reminds me of how vivid and sensual my memories of my own grandmother are. If I close my eyes, I can still walk around her home and even smell it. When we came to visit, she always used to give my parents her bed and sleep with me in her guest room. It was the only time I didn’t sleep alone, and I looked forward to it. your love for her. I can feel the pain you carried with you. =) Really a precious (and sad, poignant, wondrous) moment. What an original and sweet way to reach in to your female lineage. We usually say to ‘reach out’ but this what makes your way so special. Thank you! Yes- totally, the unique power of the feminine lineage and women’s bodies. Thank you, Christina! It’s been almost eight years but I still miss her. I hope you are doing well, friend! You are very welcome. ❤ Thanks for joining!! I'm so happy to have you in the group!! Wow. thank you, Dan! btw- I’m very intrigued about how you start poems on airplanes. I grew up on planes, in a manner of speaking. I put on my headphones and go into a writing sanctuary. It might sound a bit counterintuitive but it works for me. Especially since the rules were relaxed on use of electronic devices. More writing time. I will have to try that- I find nothing sanctuary-like about planes. Maybe because they were always taking me away from home. My dad was an expat so a plane ride often meant yet another move. Your writing is so beautiful. I love the image of the Russian dolls.It made me teary-eyed thinking of my maternal grandmother who passed away years before I was born. However, when my aunts and her sisters see pictures of one of my sisters, they say she looks a lot like her, which is such a comfort. Thank you, K! I love how we can look at someone and actually see the people we love/our ancestors in them. Beautiful, Diahann. I especially love the part about you wrapping your limbs around your grandmother at nap time . . . to try to keep her from slinking away after you fell asleep. Thank you, Nomi! Yes, she was the best pillow ever. Not even the priciest downs out there can compare. I am not sure what led me to this beautifully expressed love of your grandmother, but I am blessed from reading it. I appreciate these kind words and tribute to your grandmother’s warmth, sense of humor and your childlike wrapping yourself around her touched me deeply. I admire the final thoughts, we have our mothers, grandmothers (and also, fathers and grandfathers…) wrapped within ourselves, we may sometimes innately imitate them, or sometimes we may do this on purpose. The woman in the bank was such an inspiration for this story. I loved the details of Pond’s lotion and baby powder, your grandmother’s use of brown rather than black eyebrow pencil, then the funny time she used blue… Lovely! Thank you so much. It has been a real comfort to know exactly where I can still find my grandmother- and you are right- it’s not just the feminine side of lineages that run through our bodies for us to tap into when we have the longing. thank you, Robin. I look nothing at all like her but sometimes when my sister laughs, scooping hear guffaws with her hands over her mouth, I see my grandmother too.